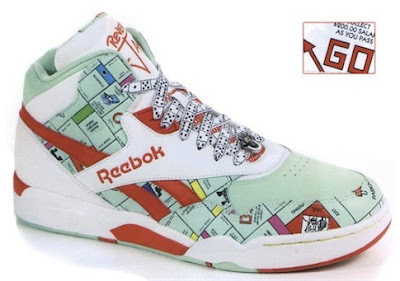 Hasbro has recently partnered up with Reebok to launch a line of Monopoly-inspired sneakers featuring parts of the gameboard and game pieces. They coincide with the release of Monopoly Here & Now: The World Edition board game, and come in styles for toddlers, kids and adults in both mid- and low-cut versions. There's no mention of them yet on the Reebok site, but they're supposed to range in price from $40 to $85. They're cute and colorful, but a little too 80s for me - as in overly kitschy 80s fads that went out of style rather quickly. Too bad Swatch didn't make a corresponding Monopoly watch design to go with them. 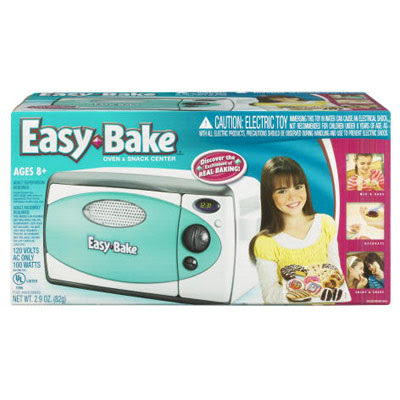 In other Hasbro news, the company is celebrating the 35th anniversary of its popular Easy-Bake oven by reissuing the toy in the retro aqua blue color that was the 1963 model. Well, it still looks like a microwave oven to me. I think it would've been more fun if they reissued the actual original design.